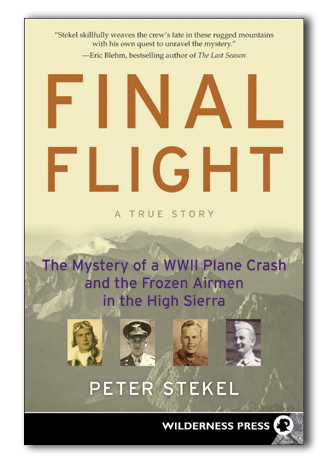 Peter Stekel will make a presentation about Final Flight at Words, Writers, & West Seattle on Friday, November 1, 2013 from 4-6 PM at the Westwood Village Barnes & Noble bookstore. He will show photos from his many trips to the Mendel Glacier crash site, discuss his discoveries there, and also discuss updates to the Final Flight story including a possible expedition to search for the remains of 2nd Lt. William Gamber and Cadet John Mortenson. This series features books by authors living in West Seattle and includes tastings of award-winning wines. The event is sponsored by the Southwest Seattle Historical Society and the Northwest Wine Academy. Admission and parking are free. Presentation at Words, Writers, & West Seattle on November 1, 2013 from 4-6 PM at Barnes & Noble Bookstore in Westwood Village in West Seattle. The address is 2600 SW Barton St. Seattle WA 98106. This is a free, open to the public, event sponsored by the Southwest Seattle Historical Society and Barne & Nobel Booksellers. A PDF of the event flier is HERE.